Check the SAM Profile integrity for any registered SAM profile. Discover improvements & compare your profile visibility to competitors. Browse historical award data for individual profiles & competitors, all while identifying and discovering new opportunities. The depth of data is enormous. Aggregate what’s important for your business, and generate reports, or schedule recurring reports. The most user-friendly & comprehensive SAM Profile Management System in the industry keeps you informed every step of the way. Automated SAM Profile renewal happens behind the scenes with updates through every step of the process. We verify your record quarterly, and audit your profile each year for your annual renewal. Billing is never an issue, and our services are very easy to calculate ROI & demonstrate the value of our services. Non-Profits always receive free services for our entry-level service plan through our mid-level services. Aggregating Government Awards from over 30 locations, a single search provides multiple, accurate results relevant to your business. Browse new Government Awards since the last time you logged in. The breadth of data can be cumbersome & overwhelming at times. Samsupport.net provides accurate & relevant results for every search. From simple RSS results to a robust API. Samsupport.net provides all the tools for your developers to access up to the minute & precise information for integration with your business processes. Samsupport.net has saved us countless hours, and lowered what seemed like an exhaustive search for Federal contract acquisition. We appreciate the services you offer, and for our business, we can honestly say the value to your services is immeasurable. Dorris PalmeriCEO# – NCORE, INC.
We have multiple brands under in our corporate structure, each with their own separate SAM profiles. Hiring out our SAM management has been a very worthwhile investment, and the ROI is easily measurable in terms of labor alone. Let alone, new Federal rewards and opportunities. Ignazzio D’AlesandroPresident# – NBTY, INC.
Searching, identifying & qualifying for Government Contracts has never been easier. 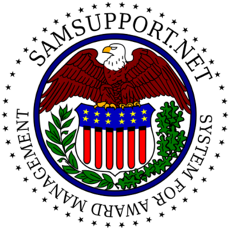 Samsupport.net aggregates awards from over 30 registries & databases to bring our customers the most comprehensive Federal Contract & Awards Data. We’ll handle your SAM Profile compliance & registration data while you focus on what’s important. Government entities searching for providers see the results displayed in order of Profile completeness & compliance, giving you an edge on the competition. Whenever a profile change is required, you’ll be able to access your profile on Samsupport.net & update the new information. We’ll make sure it’s compliant and let you know if it will affect your scoring. If so, we’ll work with you to make everything just right. If you need a change expedited, all you need to do is let us know or give us a call and we’ll take care of everything for you immediately. Your SAM Profile is a gateway to untold business growth. The Federal Government is the largest single purchaser of services worldwide with expenditures in excess of $543 billion in 2016. Samsupport.net will guarantee a complete, accurate & comprehensive profile that will move your business to the top of the list of service providers the U.S. Government uses. Try our Advanced Search for even more options!